In the rainy season, the ground is washing away beneath your feet. Nothing is ever for sure, and everything is always changing. These are the words of Agu, a 10-year-old boy in a small town in an unnamed West African country. This particular town lies in the buffer zone – an artificial zone between the government (NRC) controlled areas and the rebel controlled areas. 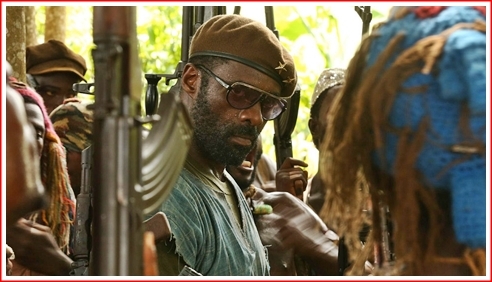 When word comes to this town that the rebels are advancing, a decision in the town is made by the elders. The women and children must be sent out immediately (to save them) and the men of the town, must stay to protect and defend the town which has existed for centuries. We hear, This land has been given to us by our ancestors, and we must protect it. Agu watches as his mother and youngest sister are driven away in a packed bush taxi for exorbitant rates. We don’t even know if they will be alive once they are a few klicks down the road. We find you all to be spies. I sentence you to immediate and summary execution. And in a few short moments most are gunned down. Agu and his older brother try to flee, and are chased. Soon the older brother takes two rounds into his back, and he is dead before his body crumbles to the ground. Agu pauses briefly, then races on into the bush. 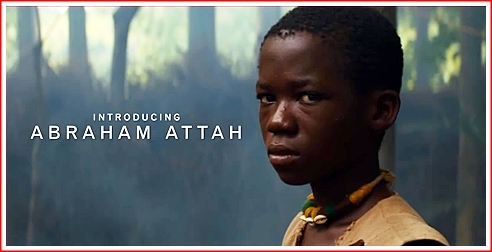 So begins the new original feature film from Netflix (available by streaming and select theatrical venues), called Beasts of No Nation, which stars Idris Elba as the Commandant, and introduces Abraham Attah as Agu. A brutal war took a boy’s family. A mercenary commander takes his youth. In this war, demons come for every one. 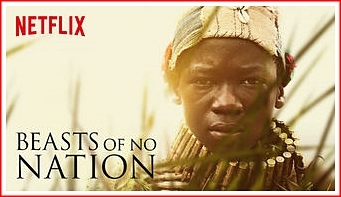 Directed by Cary Joji Fukunaga, who in the recent past directed the first season of True Detective, this is definitely a bleak film. First we watch as Agu appears as a happy 10-year-old boy, enjoying his life, and then, it is suddenly changed. He has to flee into the bush and uncertainty to save his own life, but eventually he is captured, is absorbed into the rebel army, and is taken in by The Commandant.